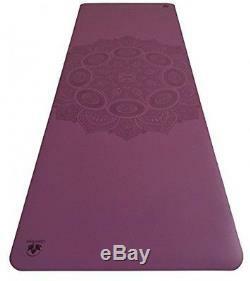 Clever Yoga Premium LiquidBalance Mat Eco And Body Friendly Sweat Grip Non-Slip With Carrying Yoga Bag (Mandala-Purple). NO SLIPPING AND SLIDING or worry of losing your grip. Stay planted and stable with unmatchable grip, even during the sweatiest practices. The most elegant, luxurious mat on the planet! REMAIN SUPER COMFORTABLE with soft yet dense cushion under your joints. Thick padding gives the perfect amount of resilience and give. The ends will not roll---They lay perfectly flat due to the natural rubber base. As opposed to most mats which measure 72? No toxic chemicals, PVC or latex. Top layer is thin, clear coat of clean polyurethane which has quick drying properties. Bottom layer is natural tree rubber. Layers are bound by heat, no toxic glues. Comes with a beautiful mat carrying bag with shoulder strap and end handle. Great bang for your buck! Made with sustainably harvested and processed natural tree rubber which is 100% biodegradable. Engineered and loved by environmentally conscious yogis. Serious Grip, Non-Toxic and Super Comfortable. No more slipping and sliding even during the sweatiest practices! Welcome to the most elegant, luxurious mat on the planet! NO SLIPPING AND SLIDINGor worrying about losing your grip. Stay planted and stable with a specially engineered supportive surface and unsurpassed traction. This mat provides unmatchable grip, even during the sweatiest practices. REMAIN SUPER COMFORTABLEwith soft yet dense cushion under your joints. The ends will not roll- the mat lays perfectly flat due to the natural rubber base. Layers are bound by heat so the mat is free of toxic glues, PVC and other toxic materials. If you are not 100% satisfied, we will do whatever takes to make you happy! The unique anti-bacterial material and a fast dry surface will make you smile after every practice. To clean, simply wipe mat conservatively with a soft cloth containing a heavily diluted mixture of mild soap and water. Designed and developed by yoga instructors. Loved by yogis of all levels! 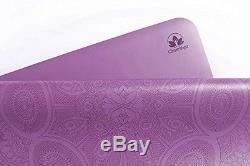 The LiquidBalanceyoga mat is extra-long (72.8") and extra-wide (26.8") as opposed to most mats which measure 72" x 24". LiquidBalanceStandard Mat: Weight: 6.5 pounds (approximately) Thickness: 4.5mm (approximately 3/16 inch) Length: 72.8 inches (185 cm) Width: 26.8 inches (68 cm) LiquidBalanceTravel Mat: Weight: 2.2 pounds (approximately) Thickness: 1mm (approximately 0.04 inch) Length: 72.8 inches (185 cm) Width: 26.8 inches (68 cm) At Clever Yoga, we are yogis fully committed to you. We test every single product before we share it with the world. It took over 2 years trail and error to develop this most loved sweat-proof and no stinky natural mat. We are confident that you will enjoy this LIquidBalance mat for a long time. Our stock all ships from our US-based warehouses. The item "Clever Yoga Premium LiquidBalance Mat Eco And Body Friendly Sweat Grip Non-Slip" is in sale since Monday, January 23, 2017. This item is in the category "Sporting Goods\Fitness, Running & Yoga\Yoga & Pilates\Mats & Non-Slip Towels". The seller is "spkbestdeal" and is located in Vineland, New Jersey. This item can be shipped to United States, Canada, United Kingdom, Denmark, Romania, Slovakia, Bulgaria, Czech republic, Finland, Hungary, Latvia, Lithuania, Malta, Estonia, Australia, Greece, Portugal, Cyprus, Slovenia, Japan, China, Sweden, South Korea, Indonesia, Taiwan, South africa, Thailand, Belgium, France, Hong Kong, Ireland, Netherlands, Poland, Spain, Italy, Germany, Austria, Russian federation, Israel, Mexico, New Zealand, Philippines, Singapore, Switzerland, Norway, Saudi arabia, Ukraine, United arab emirates, Qatar, Kuwait, Bahrain, Croatia, Malaysia, Brazil, Chile, Colombia, Costa rica, Panama, Trinidad and tobago, Guatemala, Honduras, Jamaica.